Is it about change? What about change? What is the role of humour? How can we engage in ‘collectivity’ as both social and artistic practice? What does my sister do? Isn’t everything ‘socially engaged’ really? What is the artistry of change? What is socially engaged practice? What is not socially engaged practice? Body, affect, tactility, mess, politics? Does political work need to be didactic? Who is our practice for? And how do we engage people in our socially engaged practice? What if those people we wish to engage don’t want to!? What is important about the context/environment that you work in? Public perception invading space – good/bad? At what point is my art socially engaged? How can we sustain/have a lasting impact with socially engaged artists? In what ways can it have a real impact? What kind of impact? What impact(s)? This group questioned what the tension or relationship was between an artist’s motivation and the community or group who were the participants of the artist’s intervention. We talked about how the defining of outcomes at the start of a socially-engaged performance project – a necessity seen largely by this group as associated with the requirements of funders – creates boundaries and can constrict possible outcomes for a project. The group acknowledged the need for some kind of prior aims or outcomes, but raised a concern over the tension between allowing the work to develop organically with a community group versus sticking to a prior plan. 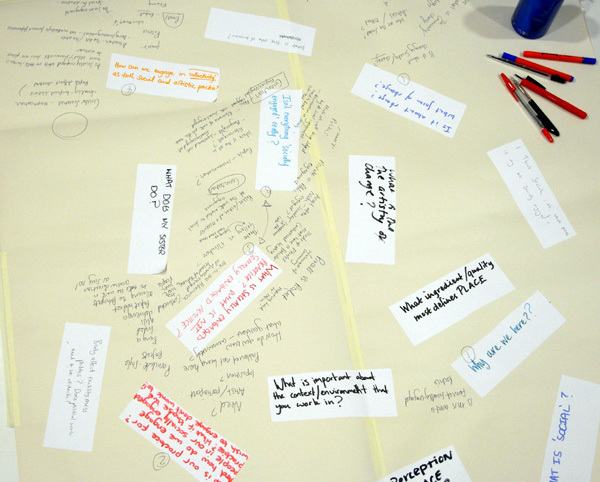 They asked about ‘need’ – what is the need for socially engaged performance practice? Who needs it? The group questioned how much socially engaged performance practice is imposed on a community or group and were critical of ‘parachuting-in’ projects, which are typified by the temporary intervention of a socially engaged artist paying little attention to the surrounding context of a community group and leaving without much concern for the aftermath of their intervention. The group discussed the importance of allowing the community to take some ownership over a socially engaged performance project, to lead it in a different direction, and to say ‘no’ to the artist. At the same time, the group identified that people do not always know what will be good for them, highlighting how resistance to a project – as much as it expresses self-determination – might also be a form of resistance to challenges and new experiences that would be beneficial and enhance a community setting. Group three were interested in two questions: 1. 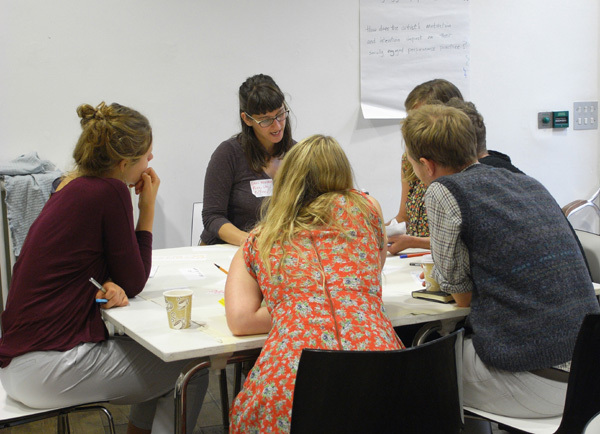 What is socially engaged practice? What is not socially engaged practice? And 2. Isn’t everything ‘socially engaged’ really? This group explored the question of what might be considered socially engaged performance practice by thinking about different sorts of projects and cultural/artistic settings. The group picked up on how art work that wouldn’t necessarily be thought of as performance may be socially-engaged, and brings with it social situations that do constitute performance moments. For example, the Angel of the North may be considered a socially engaged artwork in itself. If we have a discussion about it ‘down the pub’ does that constitute a socially engaged performance practice relating to the artwork? We talked about the difference between the gallery and the theatre as two places in which social-engagement occurs. The group also questioned whether one-to-one performance can be considered socially-engaged purely because of the level of participation involved, and this raised a question over whether socially engaged performance practice necessitates physical participation. A discussion ensued about what it means to be a passive or an active receiver/participant. A major point was raised that socially engaged performance practice responds to a sense of disconnection in society and therefore that socially engaged performance practice is often about person-to-person connection in meat space (rather than virtual environments). Group four discussed how socially engaged practitioners borrow move and cross-pollinate ideas and frameworks from one social setting to another, therefore they have a central role to play in creating a more ‘circular society’ in which reciprocity and socially beneficial structures are established. The group also discussed how in socially-engaged performance practice there needs to be an attraction to the art or artist, which helps to sustain involvement and creates a space in which everyone feels invested in the work. The group also touched upon issues around process and product, discussing how valuable the process is to socially engaged performance, and that there is a need to frame projects better around a valorization of process. Follow us on Twitter @UKinteractions (you can join by scrolling to the bottom of this page).